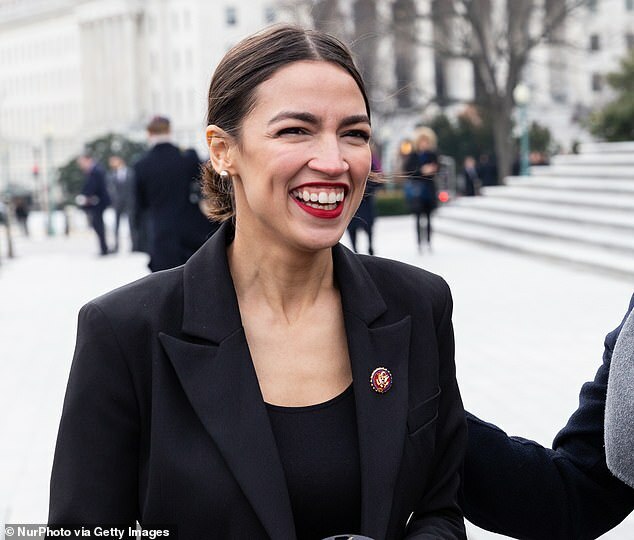 Alexandria Ocasio-Cortez was among four Democrats to march through congress and demand Senate Majority Leader Mitch McConnell hold a vote to reopen the government. 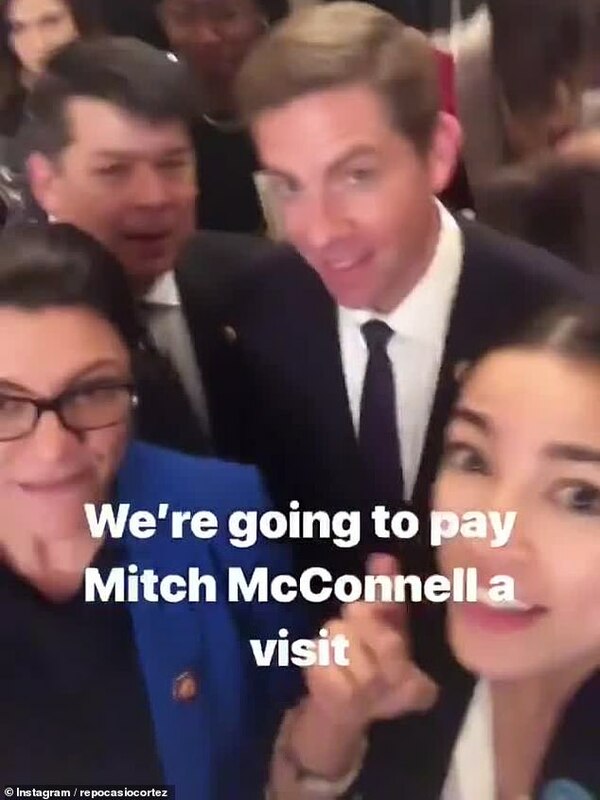 The 29-year-old progressive visited the Senate majority office, the Senate cloakroom, the Senate floor, and McConnell’s personal office trying to hunt the Republican down and deliver a letter insisting he tabled the vote. 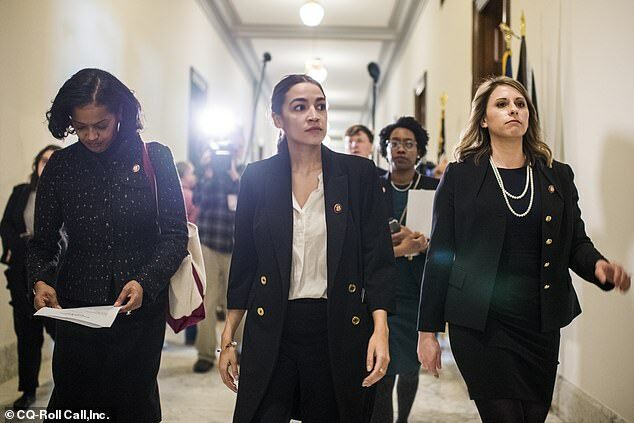 ‘He seems to be running away from us,’ said New York lawmaker Ocasio-Cortez, the youngest female member of Congress in history, as she paced through the Capitol. 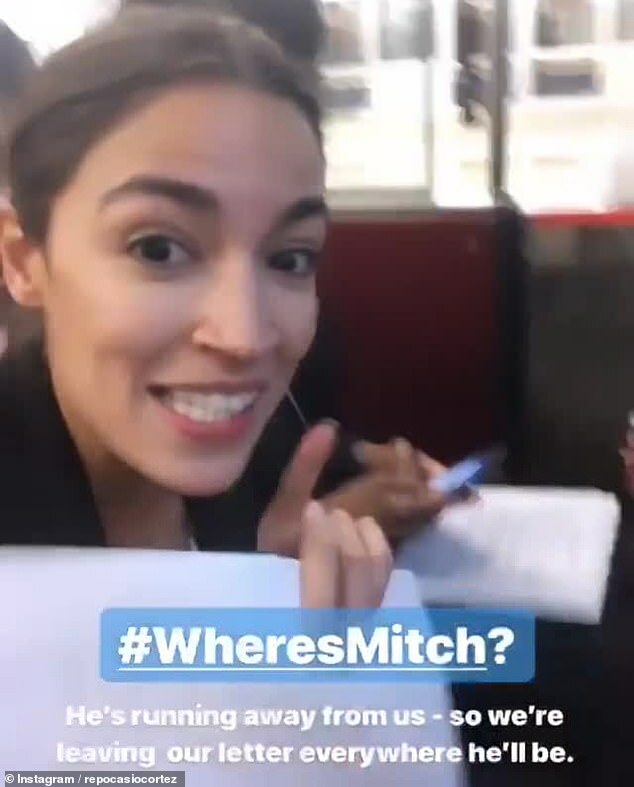 The Bronx-born progressive later started the hashtag #WheresMitch as they struggled to find McConnell. 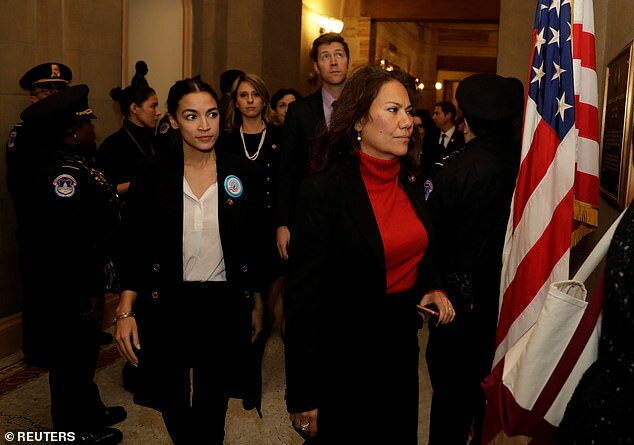 She was joined by freshman congresswomen Reps. Jahana Hayes of Connecticut, Lauren Underwood of Illinois and Katie Hill of California. Ocasio-Cortez made it very clear that House Democrats blame McConnell for the shutdown. She said his refusal to consider several bills passed by the House could have solved the problem long ago. ‘We have several Republican senators who have agreed to vote to reopen the government – it’s literally Mitch McConnell at this point, this is Mitch McConnell’s problem,’ Ocasio-Cortez said as she broadcasted to her Instagram followers on Tuesday night. The letter which freshman Democrats tried to deliver suggests McConnell is choosing to keep the government closed to please Trump and his supporters, in order to get him reelected in 2020. It accuses McConnell of ‘holding public servants hostage’. Some 800,000 federal workers have went unpaid for a month. Yesterday, President Trump signed a bill guaranteeing they would get back pay for wages lost during the partial shutdown. 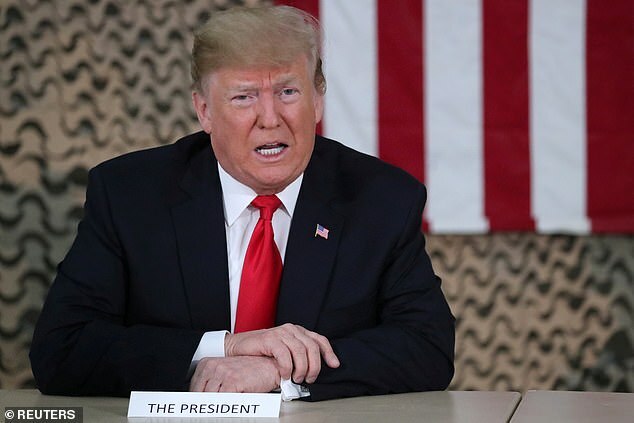 The White House announced Trump signed the Government Employee Fair Treatment Act of 2019 on Wednesday behind closed doors. The legislation signing was shut off to the media and the President made no formal statement. 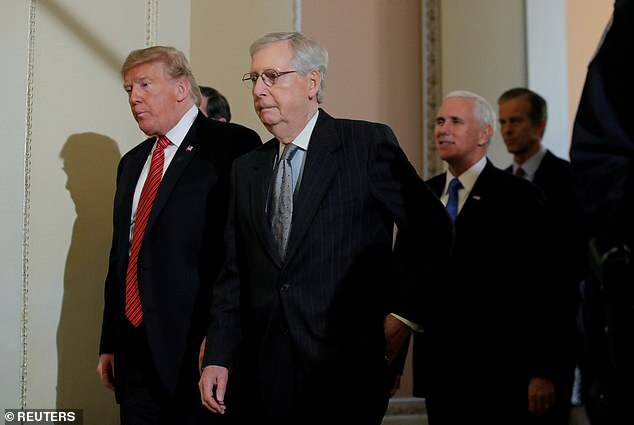 McConnell has said he won’t bring a bill – to reopen the government – to the Senate floor unless the president will sign it. It comes after Ocasio-Cortez joined the House Financial Services Committee to help regulate Wall Street. She is expected to increase scrutiny of big banks, lending and the financial sector when she takes up her new role. 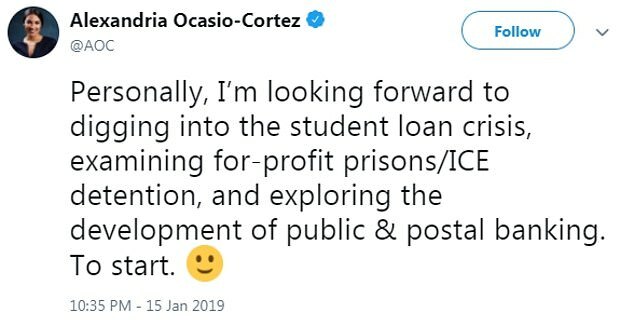 The progressive confirmed her placement in a tweet on Tuesday night and vowed to inspect the student loan crisis and examine private prisons. The news of her appointment comes after it was revealed the Latino Democrat has more power on Twitter than any of her party members- including former President Barack Obama. 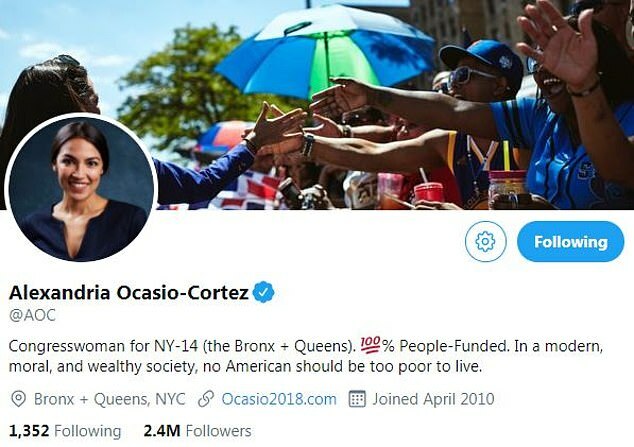 Ms Ocasio-Cortez has generated more interactions – retweets plus likes – on the social media site than party leaders Obama, Speaker Nancy Pelosi and Senate Democratic Leader Chuck Schumer.